It’s the Monday after February vacation week, arguably the ski industry’s busiest week of the year and most vital to its bottom line business. For Realtors, it’s an important week too, one in which we hope for lots of showings followed by offers. And for families, it’s a week of outdoor fun, long days in to nights on the hill, hot chocolates, board games and the kind of sound sleep that a only a day spent in fresh air can bring. For me this past week it evoked my own childhood memories in Vermont. We were a mere 10 minute drive to the mountain and every winter weekend, holiday and vacation was spent skiing (snowboarding didn’t exist back then). I would awake in the morning to the smell of fresh chocolate chip cookies in the oven and Mom and Dad scurrying in the kitchen, making egg salad and peanut butter and jelly sandwiches, packing oranges and thermoses of hot chocolate in to a large army-green rucksack. Our ride to the mountain was in a station wagon, skis loaded on the rack. We’d arrive and have an uphill walk to the lodge, a pale yellow and brown mammoth of a building with very high ceilings and a polar bear peering down from the upstairs lounge area to the first floor. Centering the room was a giant oval-shaped fireplace, a place to warm our feet when we came in for a rest, along with easily another dozen or so people who could fit around the hearth. We’d always get there for the 8 o’clock chair. During my first years, my parents taught me to ski while holding me between their legs, like they had with my four sisters before me. Like most children, I learned quickly and was able to ski any slope they ventured. The real milestone, though, was when I became old enough, strong enough, to lift the heavy bar of the chairlift by myself. From then on, I could ski independent of my parents, with my friends. I’d still see them, sometimes having a slopeside snack with their own gaggle of friends—or in the lift line. Back then, they were anywhere from 25 minutes to 45 minutes depending how busy the day. A long wait for a 10 minute run, but the wait was a time to chit chat with people in line, most of which we knew, whether they were local or “from away.” Somehow we never got impatient. On the hill we’d explore every possible trail through the woods, we’d secretly build jumps, we’d have races from the top of the mountain to the bottom—in full tuck position. I distinctly remember leading in one such race against my best friend and two boys: I got to the bottom first but the sheer speed made stopping difficult and I collided with the split rail fence at the lift. I bounced off and was a bit dazed, but happy to have “won” nonetheless. As the days would wind down we’d watch the clock at the lift intently—hoping to get up and down for that very last run before the lifts closed at 4. The next day, we’d get up and do it all over again. And years where the mountain offered night skiing, we’d go back and take more turns. I shudder to think of the runs down darkened trails for the sheer thrill of it and if my parents are reading this now, it may make them shudder still. Sadly, my home mountain went defunct and the lifts are idle. But I have my memories. Those carefree years as a child spent on the hill truly were priceless. It was such an integral part of what I was, and even who I am today; after all, my career has landed me at a ski resort—one that is much different than my small mountain in Vermont and in a completely different era, but all of the components are the same. It was important for my parents to keep their kids engaged in the outdoors and to share something as a family, for a lifetime. 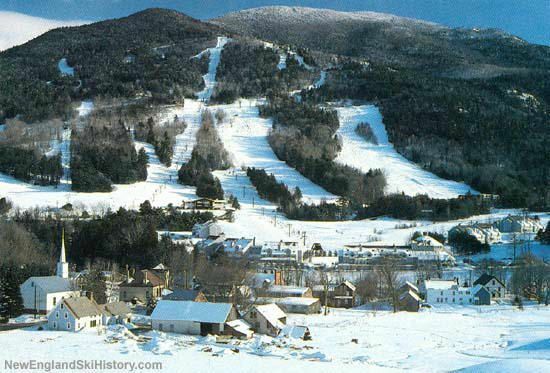 When I am selling property at Sunday River to clients who want to invest in the lifestyle for their children, future children or grandchildren, I often draw on my own experiences growing up in a skiing family. Some worry about making the right decision from a purely investment standpoint with concern about getting a return on the real estate they want to purchase, which is entirely understandable. But how does one put a price on a childhood spent on the hill? I would say you cannot.